Up to 900 elephants died in northern Mozambique over a three year period according to the latest results from an aerial survey commissioned by WWF-Mozambique. Up to 900 elephants died in northern Mozambique over a three year period according to the latest results from an aerial survey. The survey, commissioned by WWF-Mozambique shows that between 480 and 900 elephants died in the area between 2011 and 2013. The landscape survey of the Quirimbas National Park conducted in late 2013 found that almost half the elephants sighted from the air were carcasses. This week, conservation NGOs, wildlife experts and government officials have been meeting in Maputo, Mozambique, to find ways to counter this renewed onslaught on the elephant and rhino populations of southern Africa. The workshop has been funded by WWF South Africa and the German government (BMZ). “Mozambique has emerged as one of the main places of the slaughter of elephants and ivory transit in Africa and as a profitable warehouse for transit and export of rhino horn for the Asian markets. We need to see urgent action and ongoing commitment to combat these illegal activities,” said WWF International’s Policy Expert on Wildlife Trade, Colman O’Criodain. The meeting comes in the wake of increasingly alarming statistics coming out of northern Mozambique and neighbouring South Africa. Although Mozambique no longer has a natural rhino population, except for a few animals that stray across the border from the Kruger National Park, it is heavily implicated in poaching in South Africa. Figures released at the end of May showed a total of 442 rhinos have already been poached in 2014. According to South Africa’s Department of Environmental Affairs, 293 of these rhinos were poached in the Kruger National Park. In addition, authorities in the Kruger National Park recently reported the first documented case of elephant poaching in the park in 10 years. The Convention on International Trade in Endangered Species of Wild Fauna and Flora (CITES) is due to meet in July to assess progress from countries most implicated in the illegal ivory trade. Elephant ivory is primarily trafficked to Asian markets, in particular Thailand and China where it is used for ornamental purposes. “The CITES Secretariat has reached out to Mozambique to help it in tackling the problem but has received little by way of response. Governments meet in Geneva next month to discuss the issue of illegal ivory but there appears to be little sense of urgency about the problem. In particular, the international community needs to send a strong message to Thailand, which has done little to address the issue of its huge, unregulated domestic ivory market,” said O’Criodain. At a local level in Mozambique the Maputo workshop is looking at the causes of wildlife crime such as weak enforcement, vulnerable borders, corruption, a lack of institutional co-ordination, the existing legal frameworks, human/elephant conflict, human activity within conservation areas and a lack of appreciation for wildlife by the general populace. Three key areas were identified as vital in the fight against poaching and illegal wildlife trafficking including strengthened law enforcement and increased awareness across all sectors of society about illegal wildlife trade and its impacts in Mozambique. Efforts to reduce the costs of living with wildlife such as crop destructions and increased benefits through tourism were also discussed. 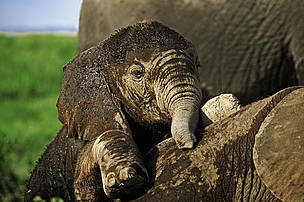 Mozambique has emerged as one of the main places of the slaughter of elephants and ivory transit in Africa.